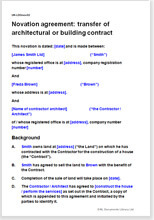 Use this novation agreement to transfer a contract for the design or build of a property to the purchaser on the sale of land. It can be used to novate any building contract, usually with only minimal editing. The consent of all three parties: the transferee, the transferor and the other contracting party is required to effect the transfer. When an unincorporated business is sold along with an unfinished land or building development. A builder, tradesman or architect who wants to keep developing the site even though the customer changes.